Eye infections can be caused by various things ranging from irritation, cuts or scratches to the cornea, to certain medical conditions that trigger infection. HordeolumA spot is the appearance of a small lump like a pimple on the edge of the eyelid. This eye infection called hordeolum occurs due to the buildup of oil, dead skin cells, and dirt that clogs the oil glands around the lashes. Hordeolum eyes can be painful, itchy and swollen, excess tears come out, or there is crust and dirt around the eyelids. To treat it, compress the eyes with a warm, clean cloth for 5-10 minutes. Repeat about 3-4 times a day. Then avoid the use of contact lenses, always keep the eyelid clean, and avoid using makeup on the eyes. If it doesn't improve, your doctor may prescribe antibiotic creams to relieve infections or inject steroids to reduce the swelling that occurs due to stings. ConjunctivitisConjunctivitis or red eye is an inflammation that occurs in the clear membrane lining the outside of the eyeball called the conjunctiva. This eye inflammation is not serious, but causes discomfort. The causes of conjunctivitis vary. 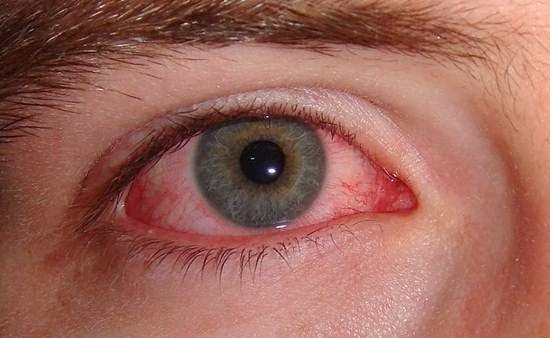 Conjunctivitis caused by a bacterial infection will make the eyes become reddish and sore, feels stuck, there is sticky dirt on the eyelashes to the eyelids like sticking. Generally it will improve after 5 days. KeratitisKeratitis is inflammation of the cornea of the eye which can be caused by various infections such as bacteria, viruses, parasites or fungi. Contact lens users tend to be more at risk of this condition. Keratitis can also occur in herpes virus infections. Symptoms that may appear in patients with keratitis are red eyes, stinging and sore eyes, sensitivity to light, watery eyes, difficult to open the eyelids, and blurred vision. In keratitis caused by the use of contact lenses, it is advisable to immediately remove the contact lenses. For bacterial infections, antibiotic ointments may be prescribed. In keratitis caused by herpes, your doctor can prescribe antiviral eye drops or oral antiviral drugs. While fungal drugs will be given to fungal keratitis. Keratitis treatment is reviewed based on the cause, so it is recommended to consult a doctor. Moreover, if symptoms appear that cause the eyes to feel pain and vision becomes blurred. AdryoadeniteDakrioadenitis eye infection is characterized by swelling of the outer eyelid. Symptoms include pain, red eyes, and watering. This eye infection is most often caused by infection with viruses and bacteria that cause inflammation of the tear-producing glands or lacrimal glands. In cases of chronic dacryoadenitis the cause may be due to non-infectious inflammatory disorders such as thyroid disease, sarcoidosis, and orbital pseudotumor. Treatment that can be done for dacryoadenitis will be adjusted according to the cause. In dacryoadenitis caused by a viral infection, it will be recommended to have adequate rest and routinely compress the infected eye. Antibiotics can be given if the infection is caused by bacteria. Dacryoadenitis needs to be watched because the symptoms are almost the same as that of lacrimal gland cancer. If symptoms of dacrioadenitis occur and protracted pain, consult a doctor immediately. BlefaritisBlefaritis is inflammation of the eyelids that can be experienced by all age groups. Symptoms of blepharitis usually feel worse in the morning, which is difficult to open the eyelids, itchy, sore and red, and the eyes are more sensitive to light. Other symptoms such as the edges of the eyelids are swollen, and eyelashes are sticky and filled with dirt or oily. In severe cases can cause sufferers to lose eyelashes. For daily treatment, patients with blepharitis can apply warm compresses to the eye that has an infection, then wipe the eyes, sambal gently massage the eyelids to remove excess oil and eye dirt or dust that sticks to the eyelids and eyelashes. It is recommended to consult with an ophthalmologist, to get the necessary treatment, such as antibiotics.